Aqua America is a publicly regulated water and wastewater utility serving more than 3 million people across the United States. Aqua New Jersey is a subsidiary of Aqua America and a water company in NJ serving 175,000 people 13 million gallons of water daily through 53,000 water connections. Aqua also offers New Jersey wastewater treatment and has 6,200 wastewater connections. Aqua New Jersey’s mission is to protect and provide Earth’s most essential resource. Aqua New Jersey delivers quality water and wastewater services by employing the best scientists and engineers who help innovate and replace New Jersey’s aging infrastructure. As a NJ water company, Aqua delivers reliable water to New Jersey cities and towns surpassing all federal and state regulations. If you are interested in learning about water privatization for your municipality, please fill out the form on the right-hand side of this page. Quality drinking water – Aqua New Jersey delivers delicious, safe drinking water to customers throughout the state. Aqua performs routine tests to all drinking water to ensure that it is safe for customers. Improving infrastructure – Aqua regularly repairs and replaces old water mains, pipes and wells, allowing Aqua to provide reliable service and quality water. Our NJ water company has the technical expertise experience to offer superior wastewater services exceeding environmental quality and public health standards. Delivering quality wastewater – Aqua New Jersey improves the quality of water dispensed from wastewater treatment plants back into the water system. Proactive environmental approach – Aqua is constantly innovating, ensuring our wastewater treatment methods are respectful of the surrounding environment, adhering to possible future New Jersey Department of Environmental Protection regulations. Safe for people and the environment – Aqua New Jersey treats all wastewater to remove disease causing bacteria and all wastewater that leaves Aqua’s plants is safe for all humans, animals and plants. Today many Americans are served by private utility providers, including gas and electric companies. Many water and wastewater utilities, however, are typically supplied by municipally or authority-owned systems. 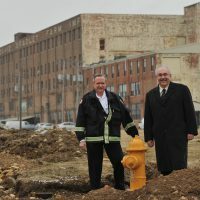 Many towns struggle with funding critical needs, including competing priorities like schools, first responders, bridges and roads and of course water and wastewater infrastructure. For municipalities or authorities interested in New Jersey water privatization, as well New Jersey wastewater treatment, Aqua New Jersey can be a reliable partner, incorporating water or wastewater structures into Aqua’s existing systems. Without the burden of water and wastewater systems, municipalities are free to utilize budgets for fewer line items and concentrate on larger priorities. To speak with Aqua about water privatization or wastewater treatment options in New Jersey, please fill out the form below. Aqua’s singular focus, as a NJ water company and an New Jersey wastewater treatment provider, is water and wastewater. 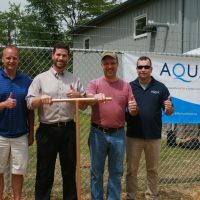 Aqua employs quality, licensed treatment operators, scientists and engineers ensuring the delivery of safe drinking water and that quality water and wastewater service remains Aqua’s number one priority. Aqua New Jersey utilizes economy of scale, expertise in exceeding federal regulations and operational effectiveness infusing needed investment into systems and improving infrastructure to provide safe drinking water and wastewater. Municipalities that partner with Aqua can focus efforts and funds on other critical needs, including education and road maintenance. Aqua New Jersey improves infrastructure systems before they break, increasing dependability, water quality and customer satisfaction. If a system does break, Aqua New Jersey provides emergency service 24-hours a day. Aqua New Jersey customers pay, on average, one-cent per gallon for the delivery of quality water to their taps. As a publicly regulated utility, Aqua New Jersey water and wastewater rates are set and approved by the New Jersey Board of Public Utilities. If you do not see your area below, please contact Aqua for more information.